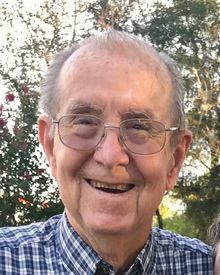 Mr. Charles Ray McCall, age 87, of Toccoa, passed away Saturday, April 6, 2019 at Stephens County Hospital. Born June 3, 1931 in Toccoa, he was the son of the late John Garcia McCall and Velma Watson McCall. He was a member of Ebenezer Baptist Church and was a United States Navy Veteran serving during the Korean War. Ray worked with Kenneth Sewell at Sewell's Furniture for 32 years and later worked at Belk. Family members include his wife of 61 years, Ruby Turpin McCall; son and daughter-in-law, Mark and Milinda McCall of Loganville; grandson, James Ray "J. R." McCall of Atlanta; brothers and a sister-in-law, Guy and Betty McCall of Martin and Robert McCall of Cornelia; and several nieces and nephews. He was preceded in death by three brothers, Max McCall, Joe McCall, and Carl McCall. Memorial services will be held at four o'clock Sunday, April 28, 2019 from the Chapel of Whitlock Mortuary with the Rev. Andy Childs officiating. Military Honors will be provided by the United States Navy. The Don Pruitt Sunday School Class will serve as honorary pallbearers. The family will receive friends at the mortuary from 2pm until 4pm Sunday prior to the service. In lieu of flowers, memorial donations may be made to Ebenezer Baptist Church, 49 Rose Lane, Toccoa, GA 30577 or to Northeast Georgia Hospice, 2150 Limestone Pkwy., Suite 222, Gainesville, GA 30501.